NGC 3521 (The Bubble Galaxy) is a spiral galaxy located around 26 million light-years from Earth in the constellation Leo. It has short, patchy and somewhat disorganised spiral arms laced with dust, pink star forming regions, and clusters of young, blue stars. Consequently, it is known as a "flocculent" galaxy. 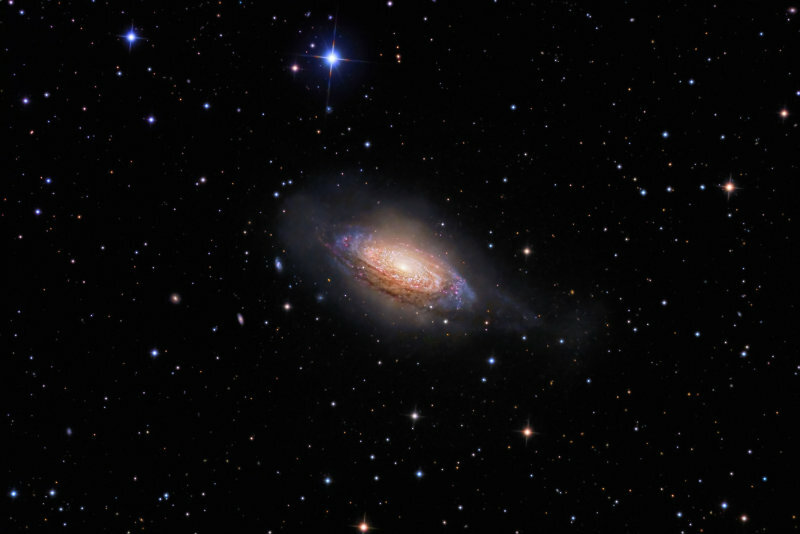 Other notable examples of flocculent galaxies include M63, NGC 2403, M33, and NGC 2841. It is notable also for the bright halo or "bubble" of very faint stars in the halo above the plane of the galaxy. This is a 9.33 hour L(Ls)RGB exposure (200, (80 equivalent), 80, 90, 110 minutes) comprising 10 minute subexposures. Poor weather and the moon prevented adding more data. Average seeing was 2.4 arcsec (Fair). The scale of the image has been reduced by 25% to mask some of the artefacts from a low integration time. FOV is 39.2 x 26.2 arcmins @ 0.79 arcsec/pixel (75% full scale).